During my time as a PhD student, I had to deal with different kinds of geothermal energy extraction techniques. The focus of my research was on shallow geothermal borehole heat exchangers, but within my team, I also came in contact with open borehole and deep geothermal approaches. To my surprise, I found that almost all of the processes involved in the various geothermal applications could be modeled with the Subsurface Flow Module. 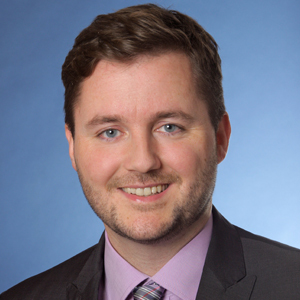 Renewable energies are a growing industry and the geothermal energy branch is a hot topic of active research. 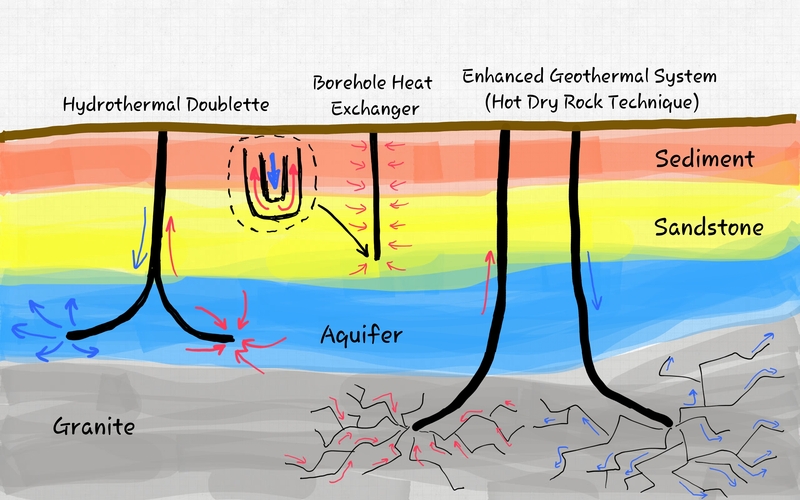 Over the past few decades, different techniques were established to extract geothermal heat from shallow to deep subsurface levels. The closed-loop borehole heat exchanger (BHE) is a standard approach for lower- and mid-depth applications. In a BHE, fluid circulates through pipes that are located inside of boreholes, resulting in indirect thermal contact between the fluid and the subsurface. This method was restricted by the closed nature of the heat exchanger with the effective heat exchange area limited by the equipment involved. This could could be significantly increased by extracting groundwater from aquifers, gaining thermal energy through the re-injection of hot fluid a distance from the injection point through hydrothermal doublets. Enhanced geothermal systems (EGS) were developed to exploit geothermal resources in dry and impermeable rocks or hard dry rocks (HDR), by hydraulic fracturing, or fracking. This procedure involves pumping high-pressure water into the desired layer to establish new cracks and widen existing cracks and fractures. Injected water can then travel through the fractures, heat up, and be extracted at a second borehole. Heat transport in the subsurface proceeds by convection, dispersion, and conduction. You need to know the thermal properties of the geological layers in order to run simulations. However, we can usually only obtain vague estimations based on geological maps and core samples. Convective heat transport, either naturally driven by buoyancy forces or artificially established through the wells, can play a role in — and even dominate — the processes. Depending on the local geology, the subsurface flow regime may be situated in fully or partially saturated porous media, or it can proceed in fractures. Although the different techniques for geothermal heat production differ fundamentally, the Subsurface Flow Module provides the required features to simulate the subsurface thermal development. You can easily couple heat transport with the velocity field. In some situations, the coupling must be applied bi-directionally. If the temperature gradients are high, the temperature dependencies of involved parameters (hydraulic conductivity, for example) are no longer negligible and must be taken into account. Also, poroelastic processes may play a role in some cases, especially when it comes to fracking. Let’s have a look at an example to demonstrate some of the features that are necessary to simulate geothermal processes. The following model solves for the heat transport around a shallow geothermal installation embedded in a geological domain. The domain is separated into various parts, representing different geological layers with their particular properties. The thermal influence of seasonal temperature changes at the surface is taken into account using the COMSOL Multiphysics internal ambient weather database. A three-by-three borehole heat exchanger (BHE) array 135-meter deep, located in layered bedrock. Each BHE extracts heat at 20 W/mK throughout the year. Between 60-70 meters is an aquifer where groundwater flow occurs, causing horizontal convective heat transport. Shown on the right are the borehole wall temperatures of the three BHEs in the middle of the array. Due to the thermal interaction between the heat sinks, the temperature of middle BHE (green line) is lower than the other two. In the region of the aquifer, the BHE further downstream than the other two (red line) is affected by the heat exchange occurring upstream of it, resulting in a lower temperature. Simulation is necessary for the prediction of long-term impacts on the BHEs in order to identify whether the pipe will avoid freezing. The most straightforward way to quickly model the BHEs is to neglect the glow and heat transfer within the borehole and apply an appropriate heat flux boundary condition at the walls. In doing so, the borehole becomes a local heat sink and heat will travel towards it. If more than one BHE is installed at a local site, the heat exchangers might start to interact after some time. In particular, if groundwater flow in an aquifer is present, the boreholes will connect thermally. This thermal interaction can cause significant efficiency losses of the whole geothermal system. On the other hand, groundwater flow also increases the thermal recovery rate. Reliable predictions can only be made if the geological data set is accurate enough. The heat transfer through the BHEs over a period of one year. The top surface temperature changes seasonally between about -2°C and 22°C according to meteorological weather data from Berlin, Germany. Notice how the heat pattern elongates in the direction of flow in the region of the aquifer. Today, we have introduced how you can use multiphysics simulation in geothermal energy applications. 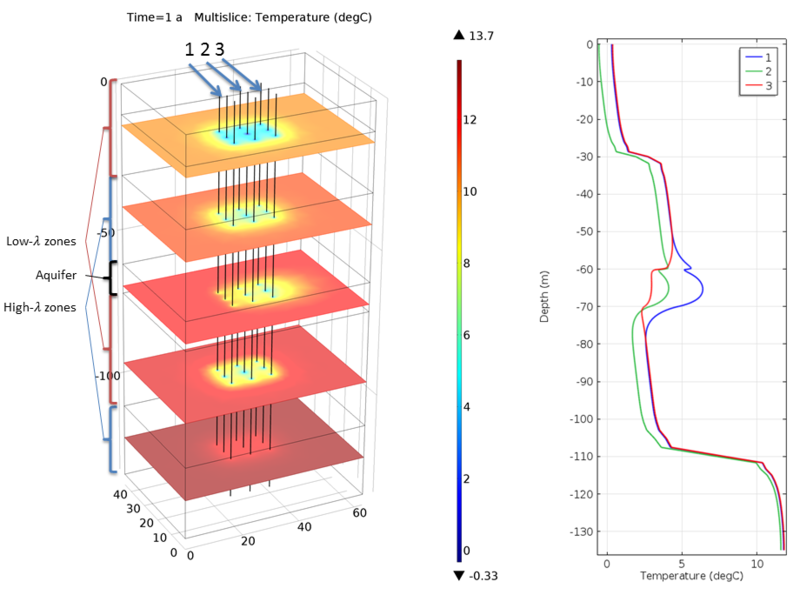 Next up in this blog series we will present a more advanced application, involving coupling heat transfer in heat pipe arrays with subsurface porous media flow. Stay tuned! I need to access the “Example Model: Thermal Impact of a Borehole Heat Exchanger Array” in COMSOL. Where can i find it? You can find the Thermal Impact of a Borehole Heat Exchanger Array tutorial model here: https://www.comsol.com/model/thermal-impact-of-a-borehole-heat-exchanger-array-19545. There used to be a report explaining this model, now its only a PPT :). Is there a way to get access to that report again? I am sorry but the report file is outdated and no more available. However, it did not contain much more information than the presentation (except for some equations, but you can find all that stuff in the COMSOL documentation). If you have specific questions about the model, please contact support@comsol.com.